I was born and raised near Lancaster, Pennsylvania, but out in the country, the first house in what today is all built up, but back in the early 1940s it was pure country. Our house, which my family built, was stuck between two farms, one on either side. At the end of our back yard, where the lawn ended, there were vast fields, sometimes fields of wheat where we kids would make maze-like paths and crawl around, sometimes fields of alfalfa where we would marvel at the spittle bugs everywhere, or fields of corn where we would run and hide, and then there were the fields of tobacco where huge tomato hornworms would appear later in the summer. These became sphinx (hummingbird-like) moths. And in spring, when the fields were fresh plowed, I would find Indian arrowheads and pieces of quartz. I became a dedicated naturalist from the age of six years, so I am told and ended up educating my family on natural history as I grew older. For some reason, perhaps because I was so isolated early on, in later years I like to live nestled in the city, although in Big Rapids, the small Michigan town we live in, we are only a couple of blocks to streams and fields where we can hike. So, I don't really want to live way out in the countryside, and here is the funny part. In my yard here in town, we let the backyard grow wild, although the city forces us to mow the front. We have had hard arguments with authorities over what plants I can let grow in my front yard. The law says "flowers," but what I call flowers, they call weeds, and there you have it. I point out to them that the word "weeds" has no real definition. One man's flowers are another man's weeds, and so it goes. This year we have a lot of mullein plants in the front. Anyway, our back yard is all overgrown, and rabbits and toads and moles and squirrels, and sometimes porcupines (and even a deer or two) have been known to appear there. Right outside our side door I have a huge patch of milkweed. 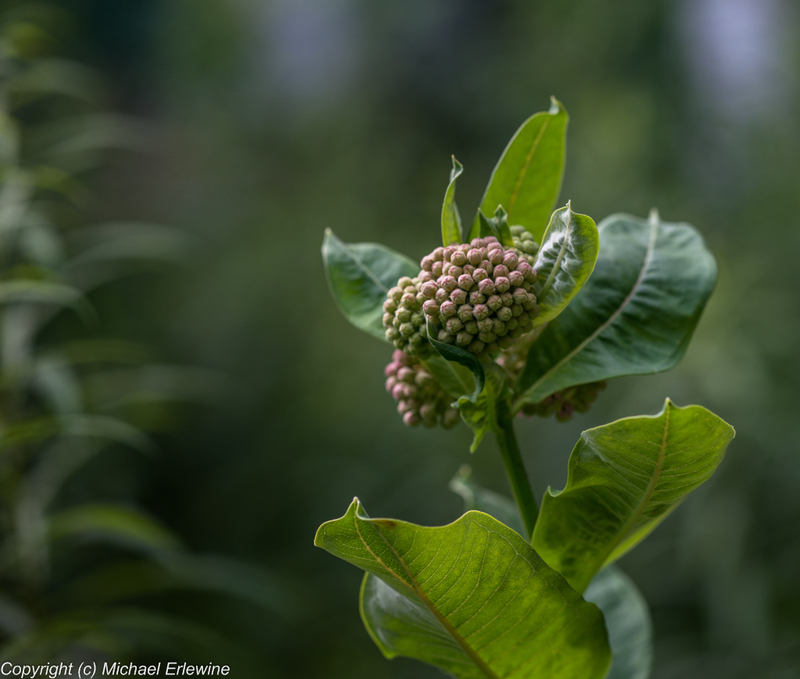 It grows tall, close together, and is a host not only to the Monarch butterfly caterpillars, but to countless bees, wasps, weevils, flies, hornets, and so on. Also the fragrance of a milkweed patch, when in bloom, is wonderful. So, while I don't want to live all the way in the country, I like to have a little patch of country right here in the city where we live. Nothing makes me happier than to see a toad hop by now and again. So here I am telling stories, when what I should be doing is finishing up my office renovation. My good friend Bruce Ling (a musician, but also an electrician) spent most of yesterday sorting out my electrical problems, removing what was dangerous and adding what was needed. And here I sit, just a little after Midnight, awake and in my office. Now, all I have to do is put my office all back together again. But I would much rather write to you about the milkweed than do what I have to do. And I have to do it right away because my granddaughter Emma is coming today around Noon and she would be all over the piles of stuff I have everywhere. So with that thought, I am back to it, or perhaps now would be a good time to take a nap?